Swampland Jewels is available NOW! The title is the first full-length release from Yep Roc Records partnership with the Southern Folklife Collection at the Wilson Special Collections Library, University of North Carolina at Chapel Hill. Produced by Steven Weiss, Curator at the Southern Folklife Collection, and remastered by Brent Lambert at The Kitchen Mastering in Carrboro, NC, the compilation features 12 tracks from the original LP and CD releases, seven newly discovered tracks, and includes liner notes by Weiss on the history of Goldband Records and founder Eddie Shuler. While hopeful to recreate the original LP track list, Weiss was unable to find acceptable masters for some of the tracks that would match the sound quality of the new transfers. In place of those tracks, he chose newly discovered songs that matched the scope and feel of what he felt was Eddie Shuler’s original intent. Much like the early ‘90s CD reissue, this re-imagined reissue of Swampland Jewels features an expanded track list. 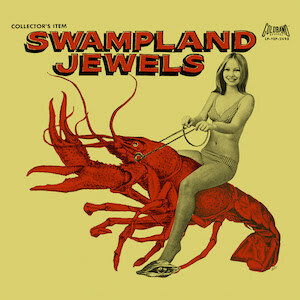 Get your copy of Swampland Jewels HERE! Pre-order Doc Watson, Live At Club 47 out February 9, 2018! Doc Watson – Live at Club 47 CD available NOW!